These days, in order to downgrade an iOS device to a previous version of iOS, you need to have an old SHSH blob of that version, and the only way to do that is to back it up ahead of time, that is, when Apple is still signing the firmware. iSHSHit is a tool that backs up the firmware’s blob for later use right on the device itself. The said app has now been updated to work with iOS 4.3.4 and 4.2.9 (for CDMA iPhones), which were both released to the public last week. iSHSHit is really easy to use. After installing the app, it can be launched from the iOS Home Screen; from there, users simply have to choose what device and version of iOS they are using and click "Save". After a few minutes, the blob will be saved within the app and can be accessed by heading over to the "Manage" tab within iSHSHit: from there, users can choose to export the blob by emailing it to themselves. It’s important to note that this app won’t restore SHSH blobs, it will simply back them up. In order to build a custom signed IPSW with the blobs you’ve created, you can do so using a tool like iFaith, which we showcased earlier, on your computer. The same tool can be used to back up blobs, in case you’re not aware, but iSHSHit is the way to go for those who’d rather do it on from their own devices. Backing up blobs has become a fairly regular maintenance practice these days, especially for those who might want to downgrade their devices in the future. iSHSHit is one of the best ways to go about it. In order to get this tweak up and running, you can follow our step by step guide to jailbreak your iPhone, iPad or iPod touch on iOS 4.3.4 using Redsn0w or PwnageTool (iPhone, iPad, iPod touch), or iOS 4.3.3 using Redsn0w, PwnageTool, Sn0wbreeze or JailbreakMe (that last one being the easiest). 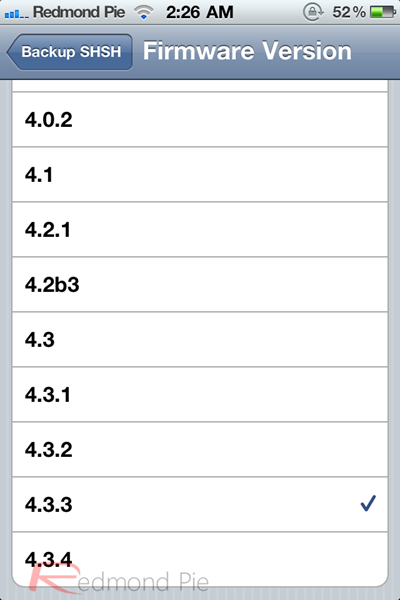 If you’re already using iOS 5 beta, you can jailbreak it using tools like Redsn0w (for Mac and Windows), or Sn0wbreeze.